The main channel of the Chesapeake is currently closed to most fishing due to dense, muddy water. Debris fields containing trees, logs, railroad ties, even 55-gallon drums and partially-submerged refrigerators make it nearly impossible to navigate anywhere near the Bay Bridge. The Susquehanna River remains near flood stage, so there is more bad water and trash to come. 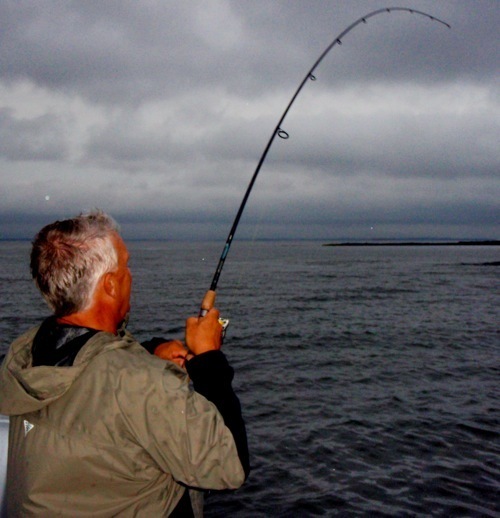 What’s a light tackle fisherman to do? Go east, young man – go east and go shallow. If you aren’t fishing the shoreline right now, you’re missing some of the most spectacular top-water action of the year. September is almost always a great month for top-water fishing, and it’s even better now since fish have been pushed out of the muddy waters of the channel toward the shorelines. Better yet, the high water makes it even easier to get our boats in tight and fish the current swept banks. Nothing gets my blood boiling like nice fish blowing up on top-water plugs in less than a foot of water. 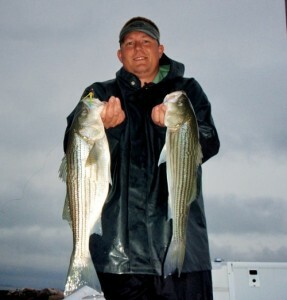 For the past week or so, shallow-water stripers have been extremely active in the late afternoons. I haven’t tried mornings, but I hear the bite is equally as good then. The evening shore-side feeding frenzy usually begins around 5:00 PM and builds to a crescendo just after sunset. Since we have a full harvest moon, many fish are feeding well after dark. Maybe you’ve seen the video attached at the bottom of this report. I shot it last year about this time, and it’s worth another look since we’re on the same moon and identical patterns. I haven’t taken the time to put a video together this September, but the action has been just as fast and furious at very similar locations. Striped bass feed in the shallows in September because there is plenty for them to eat along the shore. Bait includes silversides, killifish, anchovies, small shrimps, and young crabs. 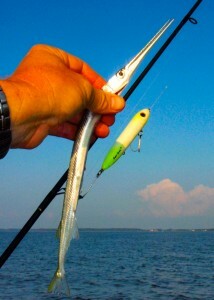 One of their favorite shallow-water baitfish is Atlantic needlefish. Needlefish enter the Bay in early spring to spawn, and stay until October or November. In September, they school on the surface around rocks and marshes where they use their strong, scissor-like jaws to ambush small minnows. Since their average length is about 10 inches, they’re the perfect size bait for striped bass. Needlefish style plugs are not extremely popular in this area. They should be because they’re deadly this time of year. If you don’t have them, don’t fret. An oversized spook or extra-long chugger can be equally as effective as long as they float high and are heavy enough to cast accurately. Like stripers, needlefish are very aggressive, so don’t be surprised if you see them darting after your lure. If you’re lucky you might even catch one. The secret to finding a good top-water spot along the shore is to look for deeper, current-swept banks. Stay alert for rips coming off points, piers, or jetties because they can be very good. The most likely top-water spots are usually right under your nose, sometimes within casting distance of the boat ramps. Think about that rock jetty you pass on your way out of the marina, or the grassy points you buzz by when you’re looking for breakers. Stripers feeding along the shore move around from place to place, so you usually have to search several likely-looking spots until you zero in on the action. When you find the fish, pay close attention to the pattern. Did you find them on rocks or grass? Are they in tight to the shore, or well off the bank? Are they aggressively feeding on the up-current side, or holding back in the lee of the points? Once you answer those questions, apply the same patterns to similar areas. I fished each evening this weekend. My partners were Rich, Jamie, Mark and Mike. We caught dozens of top-water fish on every outing. Undersized fish along the shore are rare, and thirty-inchers are well within the realm of possibility right now. Although I moved around frequently, I found fish at multiple locations, even along rocky banks near the main channel, and way back in the Eastern Shore rivers. The best lures are needlefish style spooks, heddon super spooks, Stillwater Smackits, and Lonely Angler holos or similar. There are some nice fish around, so there’s no need to throw small plugs. Since the fish are plentiful, do yourself and them a favor and remove those treble hooks, especially the ones on the back of the plug. Mature stripers attack their prey from the front. You won’t miss strikes if you remove the back treble and you’ll drastically lessen your chances of getting a hook in your hand. I think the skinny water pattern will hold for a while. Water temperatures are now in the low to mid 70s. The Bay gets a lot clearer and cleaner south of Poplar Island. All the Eastern Shore rivers are clear and the water is pretty good near their mouths. There are still lots of bluefish and small rockfish breaking, sometimes even in the muddy channel. The main stem of the Bay clears south of Breezy Point. It’s business as usual farther south. Reports from the Point No Point area have been very good this week. One word of caution, there are many submerged rocks, stumps, and trees around those shallow banks. Every year boats are severely damaged when anglers venture too close to jagged rocks and shoals. Some are even sunk. One mistake on an unfamiliar bank could cost thousands of dollars in engine or fiberglass repairs. But if you know some safe spots, or better yet, if you have the determination to paddle or wade, now is the time to go east and go shallow. TOPWATER IS THE BEST. I HAVE SEEN AT TIMES THAT THEY ARE NOT ALWAYS AT THE SHORELINE, AND THAT IF YOU ARE ON A DRIFT WHERE YOU CAN HIT THE SHORE YOU NEED TO TRY TOWARDS DEEPER WATER AS WELL. Another fine report Shawn… I’m gonna have to change my name to “fish-broke”… working now for gas money to get back down there… that pattern is one of my favorite ones to fish. See you soon! Well said Shawn. And once again I’m right there with ya. 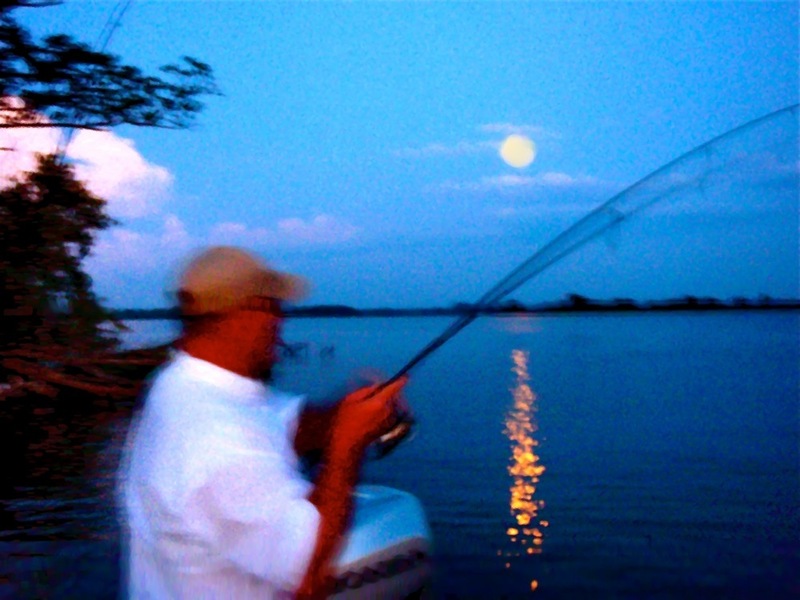 I have been fishing the shallows and spots that I usually run past with crazy action. I could see the bottom in 7′ of water today and watched my BKD get hit. Amazing! Call it luck or that I may actually be learnng but the end of summer and early fall has been the best I’ve ever done. I even caught a needle fish too. He hit my mono and got tangled. Thanks for all the help and the tips. Sea ya on the water! Shawn, great time as usual last night…Isn’t there another pic with “Hondo” the pretend to be an eagle seagull missing?….(Grin)…. Let’s all pause and say a prayer for the livelines and trolls. Never a bad idea to spool up a separate casting rig for topwater plugs. Mono instead of braid will keep you from having an “oh &^%$! !” moment and jerking the bait out of the fish’s mouth…pretty easy to get excited when a 30″ rockfish attacks your lure with the force of a Mack truck. Good advice throughout. Hey Les, You’d think some of those fellers would break down and cast a plug wouldn’t you? Jamie, I’m saving those pictures of Hondo the giant eagle for the right moment. For now, I’ll just say I’ve seen a lot of birds caught, but that’s the first time I’ve seen anyone cast up on the bank and pick one off a perch. That Rich sure is talented! Hi Shawn — I noticed on your Facebook page that you fished yesterday. I thought this part of the Bay was done, but it looks like you’re still catching. 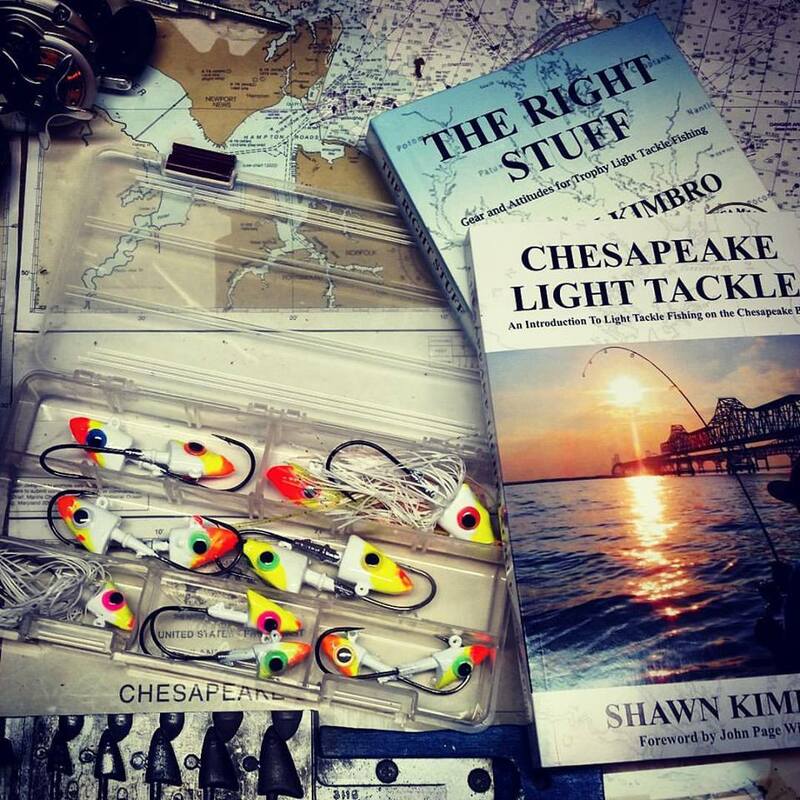 Are you trailering south or still fishing from Kent Island? Hi Jeremy – Yes, I launched off Kent Island last night. I found some clean water, so I hit some rips and points and found fish willing to take a topwater plug. There were no birds or other indicators of fish, just blind casting to good fishing spots. 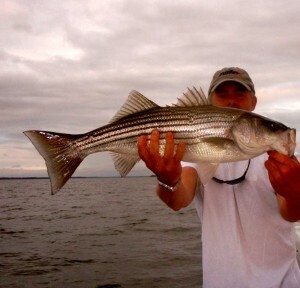 My father-in-law caught his first rockfish on a chugger, a 24 incher and my wife got a 27 incher on a Heddon spook. Several other fish including some blues in the shallows.